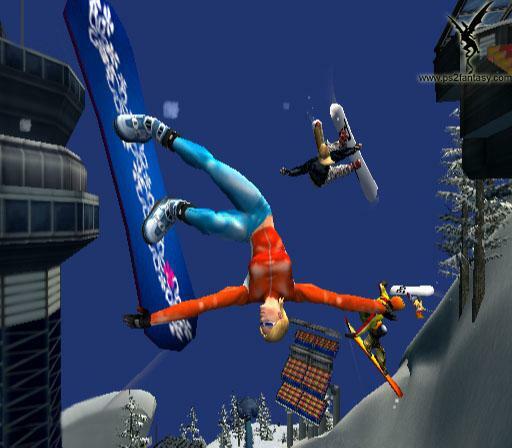 SSX Tricky is the sequel to the older game titled SSX that PS2 owners should be familiar with. The new version contains fresh graphics, retrofitted courses, 6 new characters, and the biggest addition: Uber Tricks. When the boarder performs an Uber Trick, his/her feet ?detach? from the board and they do some pretty impressive stunts. One guy rides his board like a horse, another spins it in front of him like an airplane, while another uses it like a bench. All of the characters have their own personalized Uber Tricks with varying points and difficulties. The graphics in this game looks much better in comparison to the older SSX. Sometimes, when you ride off a big jump, fireworks shoot out as you land a big move, and as you ride through the level you see the trail of snow behind you. Both the sound effects and music in SSX Tricky are good too. Most of the songs that you?ll hear in the game are made by the EA sound team, and the songs that are made by real bands are remixed and edited because of content. The voice acting is good, however there is some crackling when the character talks. From a Christian standpoint, this game is fairly clean. Some of the female characters show cleavage, but you can change the costume. The ESRB rated the game E for comic mischief, mild language, and mild violence. I understand the mischief and mild violence because of the shoving and falling, but I don?t comprehend the mild language part because I have found that the game is clean of verbal obscenities.